Maxximilk's mission is to enable dairy farmers to dramatically boost profitability through the transfer of pedigree-embryos that result in increased milk yields... in record time. Maxximilk produces highest quality in-vitro-ready-for-transfer-pedigree embryos. All genetic materials are derived from professionally inbred cows with average annual milk yields of 11.5 tonnes. Maxximilk enables dairy farmers to bypass decades-long breeding programs and acquire new herds of champion milk-producing cows within only 32 months. 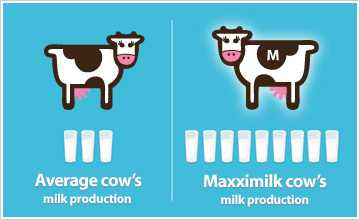 How can Maxximilk help you earn more? Using Maxximilk's embryo transfer program for progressive herd replacement will increase the number of superior cows in your herd for higher profitability. In-vitro fertilization is a reproductive technology in which an egg is obtained from the female and fertilized with sperm in-vitro (outside of the body, or literally, in the laboratory). Maxximilk specializes in in-vitro production of highest quality embryos-for-transfer. Sperm and eggs come from top-performance bulls and cows with proven, average annual milk yields of around eleven and a half tonnes - the world's highest average milk yield!